Set in the sand at the Centre’s ground level, an up-ended stump evokes the discoveries to be found on a day at the beach. In contrast to the terraced plantings and curved concrete pathways that encircle it, the stretched limbs, knees and elbows give this object creature-like qualities. This specimen can bear weight, and can indulge the impulse to balance, swing and jump. It cradles a boulder in the tangle of roots, and its knots and variegated skin reward both visual and tactile curiosity. Pockets of shade and small sheltering bays are formed at its base, inviting experiments in crafting miniature worlds. Warren Brubacher states “There are only pockets of the original forest remaining within the BC rainforest and the ancient stumps and remnants that are left behind from logging here in the Squamish area are the treasures that I gather.” This irregular ‘wild wood’ carries with it centuries of history in the gnarls, twists and burls that deem it unusable, and these sculptural features blossom as he cleans, carves and sandblasts the forms. 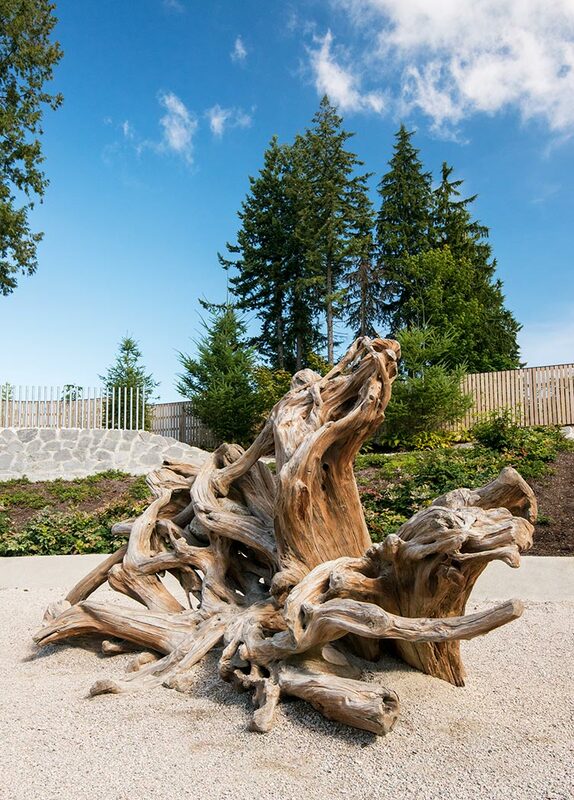 Brubacher has repurposed this massive stump for his installation, with an eye to preserving hand- and footholds, while smoothing and finishing the sinewy roots. His process unearths the tenacity found in how the tree once worked its way around rock, sought sustenance and clung to the earth, and preserves an ancient story to be learned hands-on. 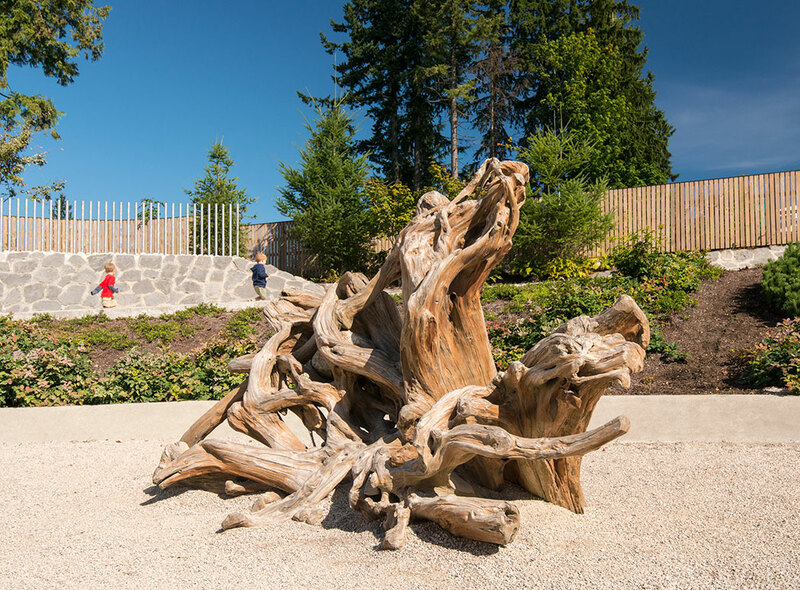 The sculptural play huts devised by Alastair Heseltine are formed from pliable cedar branches cast off from logging operations and woven in a manner reminiscent of ‘wattling’, an ancient technique of fence and wall construction found throughout the UK. The stately urn-shaped huts vary in their height and width according to the natural spring of the stripped green boughs as they are held taut and rooted by metal armatures. In following the arc of a sapling from foundation to peak, and in tracing how it is joined with others, one observes the strength and integrity of these contingent structures. Laid out in a small village with a meandering gravel path, the dwellings introduce a quiet sense of ceremony to the rooftop level of the Centre. The boughs are bundled at the base, creating curved doorways to the domed interiors. Within the protection of the enclosures, one may hide or seek, spy on the outside spaces, and gaze up through a chimney-like opening to see framed views of the sky. Curtained by the textures and scents of the forest, small gatherings and quiet conversations are given room. These shelters introduce the unique and irregular variations of things that grow to the echoing curves and precise angles of the surrounding hardscape. As the elements weather the cedar, and the seasons are coloured by change, the timelessness and endurance of these forms remain. Taken together, and in a beautiful collaboration with the adventurous features, abundant space and clean design elements of the Centre, the three works respect the seriousness of play. Set apart, in each of three areas, the works are heightened through their contrast to the materials and forms that surround them. The shiny chute that slides from the rooftop to the sandpit, the smoothly curved ribs set close to the play huts, the berm that nestles Nightswimming: all provide a balance between the carefully machined or engineered and the skillfully handmade. Amongst the scatter of tricycles and other investigative tools, these works carry an intimacy and knowledge that stems from the artists’ lifelong relationship with the land. Heseltine, Brubacher and Comber have tested the strength, explored the capacities and qualities, and brought forward the histories of the materials they use. In doing so, they invite these same creative acts: to measure oneself against the scale and weight of ancient timber, to study its potential and to interpret its character. Warren Brubacher has lived and worked in Brackendale, north of Squamish since 1990. In addition to working with natural wood, Warren is an experienced log home builder and blacksmith. Several of his artworks can be seen along the dyke in Brackendale, in Whistler’s Rainbow Park and on the Cheakamus River.